This totally non-influencing clamp automatically equalizes the pressure on each side of the workpiece as the clamping force is increased. Thin, easily deflected workpieces can be held firmly so they remain in their original location during machining. Equalizer Clamps can hold parts in positions away from the locating points. This can eliminate the need to clamp directly over rest pads. The Equalizer Clamp works best on Stevens grid pattern primary tooling where the tapped holes are available to hold the clamp anywhere it is needed. It can also be fastened to table "T" slots or utilize tapped holes in a tooling plate or dedicated fixture. 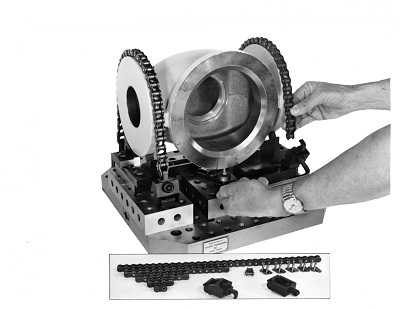 Higher profile rocker arms are available for clamping larger cross-section workpieces. Workpieces up to 2" thickness can be held in this way.